Last weekend we went to Bristol Harbour Festival and, as always , had an excellent time. Good food, drink, music, and surprisingly weather, even the bus journey home was enlivened by a child spilling a box of brightly coloured beads and the frantic dash to retrieve them all as they rolled around the floor of the moving vehicle. The Bristol M Shed museum had just re-opened by the harbour on the site of the old Industrial museum. This seemed like a perfect opportunity to visit. The museum aims to tell the story of the city from prehistory to the present day. The Telegraph reviewed it better here than I can. I was, perhaps predictably drawn to the transport section which featured a full size model of a carriage horse. 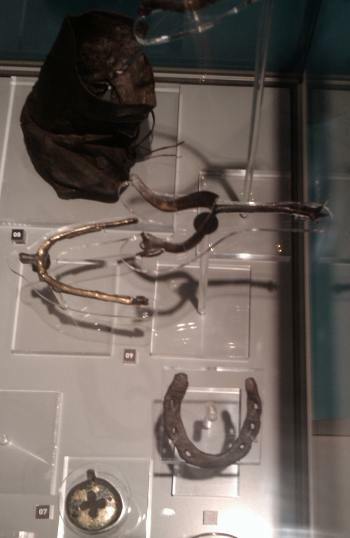 The display next to the horse showed a 12th century prick spur and a 14th/15th century long necked rowel spur, a wavy-edged medieval horseshoe, a harness pendant and, most fascinating, an 18th/19th century poultice boot. It was such a nice day I didn’t really want to bother a curator about Henry’s somewhat unconventional bitting arrangements…. Maybe I should write & tell them that it’s upside down…. 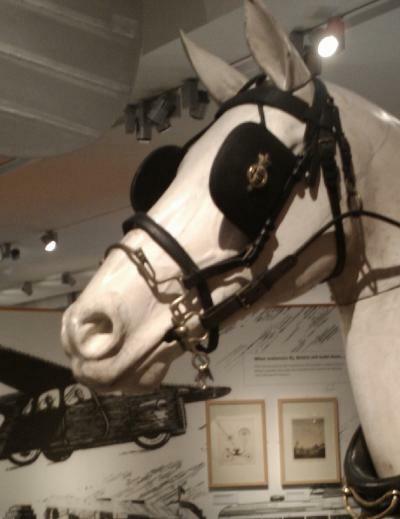 This entry was posted in Horse Bits, Uncategorized and tagged Bristol, museum. Bookmark the permalink. I too noticed when the museum first opened [reopened] that Henty’s Buxton bit was not only upside down, and back to front, but that he had a crupper for a ‘martingale’ chest strap! I offered to put it right, and reported it as incorrect to the curators, but they still have done nothing to correct poor Henry! thank goodness he isn’t a real horse, as he would be in serious pain! Yesterday I went again, and Henry is still tacked up in this unconventional way.I really feel like offering to do the job myself [again] but evidently the machinations are slow, and probably involve ”risk assesments” &c! Henry is my favourite Exhibit at the museum, and in London there was a magnificent saddler’s model in a window of a saddler’s [long acre, possibly?] and the horse was in original paint, with dapples. Poor old Henry, I hope someone sorts him out.Come on , Bristol M Shed! it will only take a few minutes to put right! We’ve had a go at sorting Henry out but I’d be delighted if someone who knows would call in and check what we’ve done – no-one here is an expert on horse harness, and we sometimes wonder whether the harness sets we are using are complete. Henry looks much improved! – went back to MShed last weekend. Whilst I’m not a driving expert (but do know about horse tack generally), his bit now the right way up and crupper in the right place which were the main things I had spotted.